I just posted a tour de force video of an hour and 26 minute discussion about two years of development that has brought Domain of One’s Own to the brink of international greatness where we find it precariously teetering currently. This post will provide the puff of breath necessary to send it over the edge. 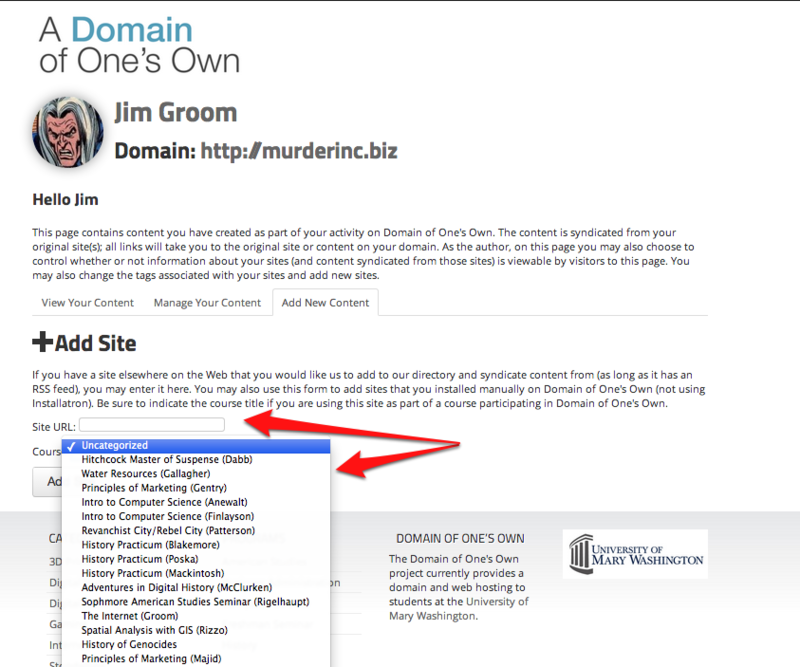 Below are eight new features, and I’m sure I’m missing a few more, about the overhauled Domain of One’s Own that Martha Burtis and Tim Owens have been building out over the past month that have me more excited that ever about the future of Domain of One’s Own at UMW and beyond. 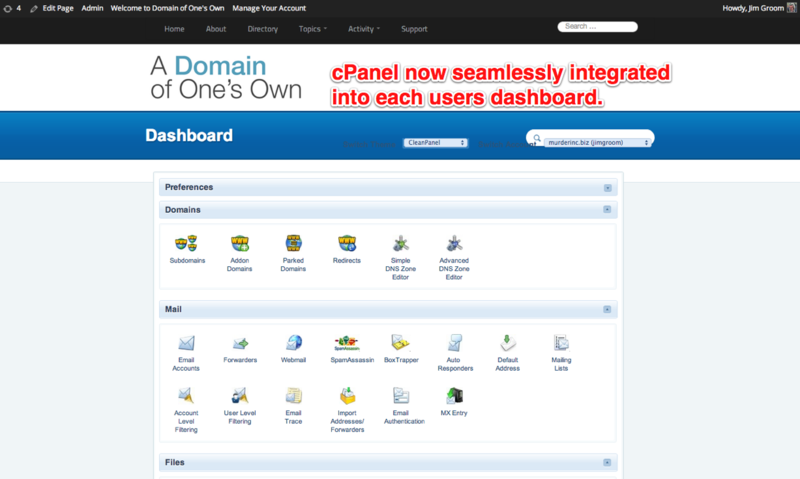 First and foremost, we now have UMW Domains integrated with Centralized Authentication Service (CAS) that now enables us to take the various logins for CPanel and the billing anagement software WHMCS (which our community need not see) and fold them into the main campus netid and password. This is huge, the hardest part abotu a project like this is keeping your passwords straight, and we just made this a whole lot easier. 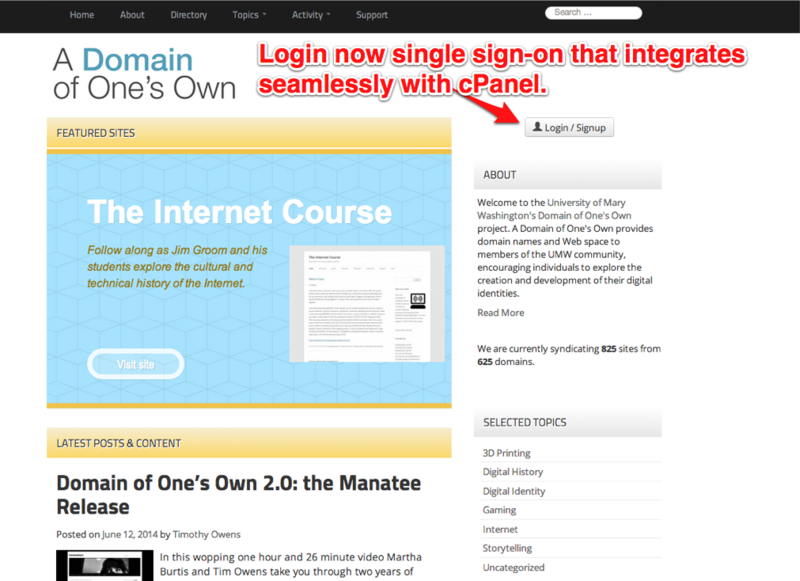 When you login to UMW Domains, the first thing someone will see is the personalized CPanel for managing their web hosting account. BAM! This is being pulled in through and iframe based on some Tim Owens magic, and we aren’t sending users away from the UMW Domains site, they’re doing all their work from one space. The idea of coherence matters, and these first two steps are a huge boon to making our community’s experience a seamless, user-friendly one. 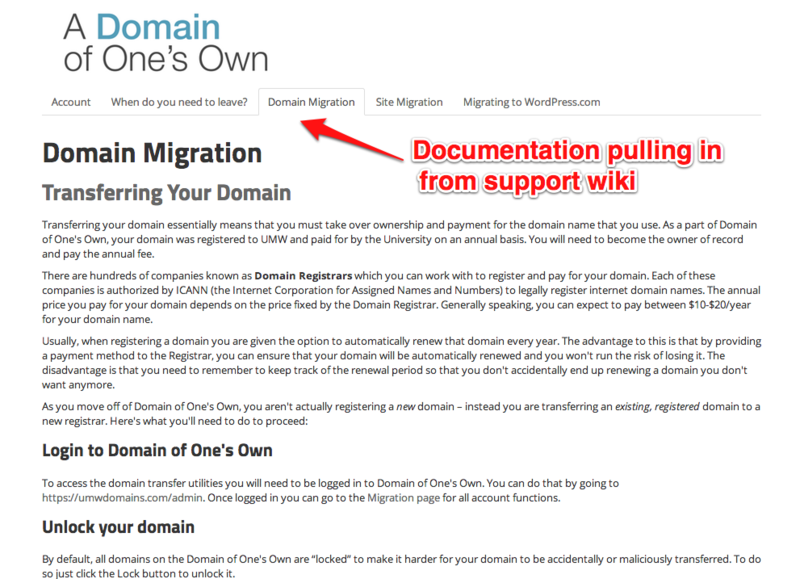 Another element that build on the tighter intergration of features in Domain fo One’s own is the ways in which your dashboard lists your domains, the relevant registration and renewal dats, as well as provided contextual support about what an EPP code is and how you use it to move your domain. 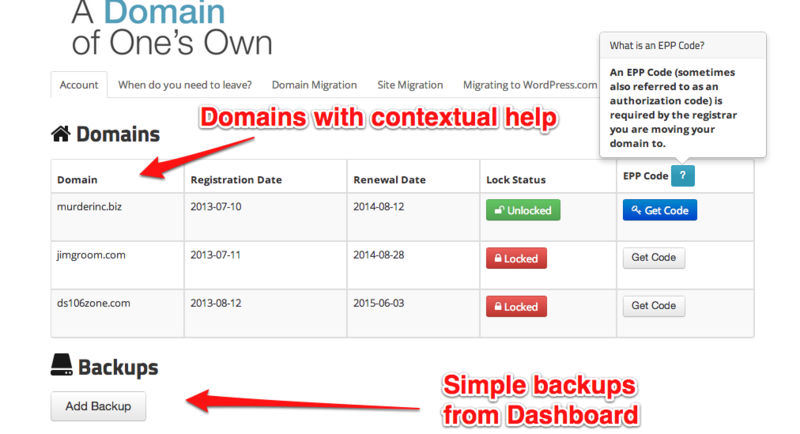 In effect, Tim used the WHMCS API to pull that information into the user’s Dashboard on Domain of One’s Own. Same goes for backups, through the CPanel API Tim allows anyone to get a full-backup fo their entire account with one click. We truly want folks to own and seamlessly take their work with them. Next steps is allowing them to send it to Amazon S3, DropBox, etc. 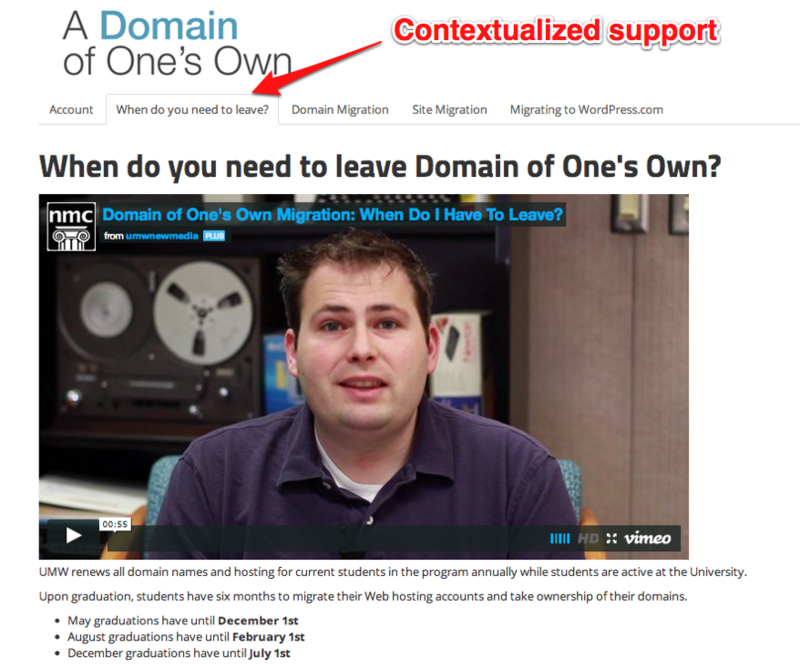 One of the things you can see in the screenshot below is a series of tabs alonside the Domains and Backups account information that contextually provide support for students, faculty, and staff that want unlock and transfer their domains. Building on the last point, we’re including that contextualized documentation through a transclusion plugin for DocuWiki developed by students in Karen Anewalt’s Software Engineering course. So, not only do we have all the docuemntation authored in a centralized wiki, but we can contextually include it whereever we want in the Domain of One’s Own dashboard. One of the rad new features Martha developed is the ability to view all of a person’s domains, sites and recent posts in one place. 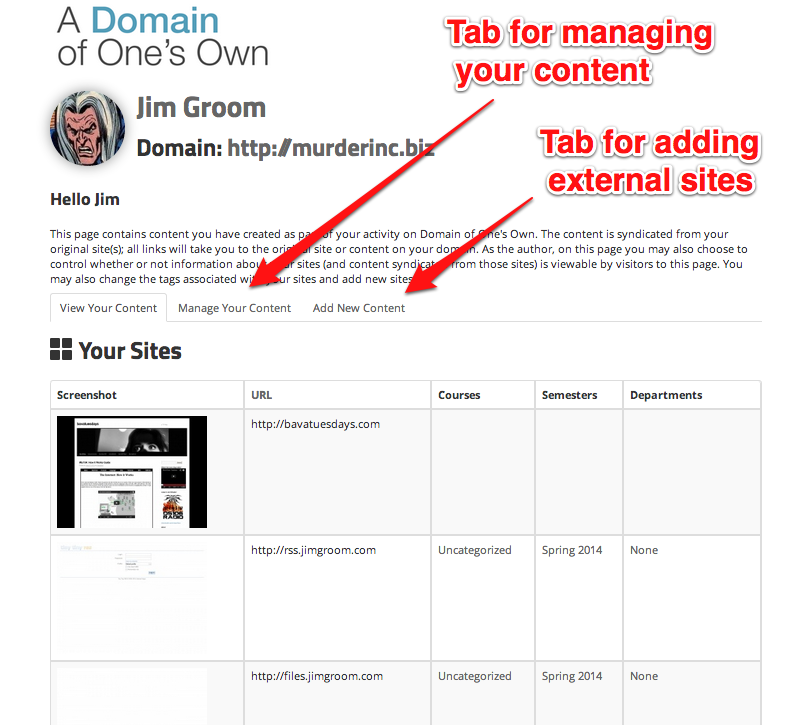 What’s more, if you are logged in your dashboard, you wills ee tabs for managing your content and add new sites. More on that in points 7 and 8. One of the things we struggled with during year one of UWM Domains is reconciling the rhetoric of reclaiming your work and owning it with making everything syndicate into the main site. This the latest version, our community members can decided which sites are public and which are private. 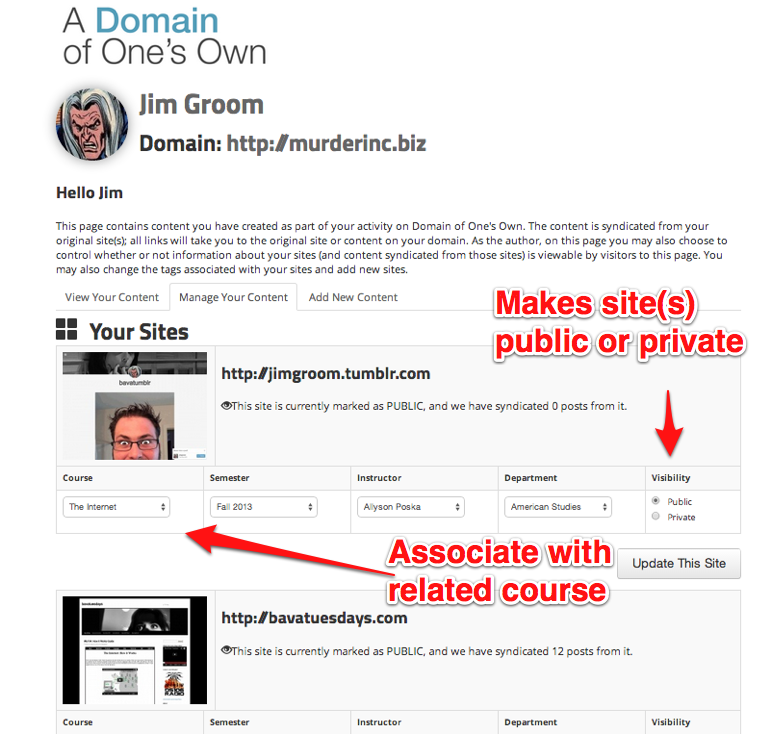 What’s more, they can decide which site syndicates where in terms of courses. For example, if a student has selected The Internet Course when created a blog and now wants to use that blog for a new course, they simple head to manage content and change the course they want to associate their site with. This is so groovy! But that’s not all! With the Add Content tab, people can add any site on the web with a working feed and assocaite it with a class. This includes targeted feeds off of categories or tags. I lvoe this feature because it effectively open up the Domain of One’s Own community to any site that person uses to publish on the web, as long as it has a working RSS feed. EDUGLU anyone? Image credit: Thanks to Ryan Brazell for the awesome Teeter Totter GIF. This entry was posted in Domain of One's Own and tagged domain of one's own, uwmdomains. Bookmark the permalink. so impressed by the UMW projects. keep it up! 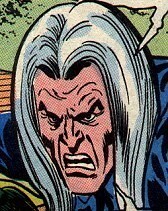 This is “volume turned up to eleven” turned up way past 11. No laurel resting happening at DTLT- congrats to all and for being one of the few places ed tech is pushing out.